Weddings InStyle: The Winner of the "I Do Dream Come True" Contest. The Winner of the "I Do Dream Come True" Contest. 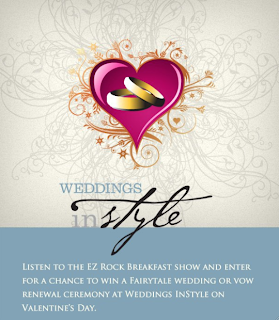 Back in October while walking at the CIBC Run For the Cure, Neil Headly the morning show host of EZ Rock 99.7 and I decided we wanted to create a contest for Valentine's day. Months later, after back and forth with the station the "I Do Dream Come True" contest came to life. We were in search of Ottawa’s most romantic love story. This morning Neil & Viv announced the winner of the contest. 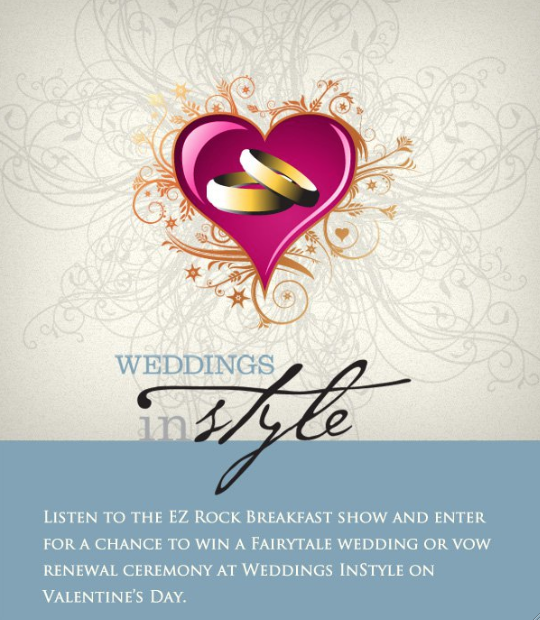 Jennifer Lang and her husband Bob will be saying, " I do" live on 99.7 EZ Rock in a dream come true vow renewal ceremony right here with us at Weddings InStyle on Valentine's Day. Jennifer will walk down the aisle in a dream dress from With Love Bridal, holding a gorgeous bouquet from Ottawa Flowers. They will also enjoy a cocktail reception for 30 of their closest friends, while being photographed by Ontario's #1 Photo Journalist Kathi Robertson. Don't worry - there will be cake too, Kate Green is supplying the dream cake and we promise to post pictures. What inspired us to choose her story? There were so many love stories and we enjoyed reading all of them, honestly it was tough to decided. This story won our hearts because it sums up the notion that true love really does conquer all. My husband Bob and I met at my daughter's four-birthday party in a small condo area in Barrhaven. He had just moved into our neighborhood and all of my neighbors thought that I would find him quite attractive and told me that he was a single dad of two small kids. Which was perfect as I was a single mother of two kids. His kids came to my daughter Jenna's BD Party and it so happens that his two-year-old daughter's name was Jenna also. The girls played and became close friends over the next few weeks. His son Chris who was 6 years old really looked up to my son Joey who was the oldest at 11 years old. Our children all become very close, so the next step was to get the parent's together. So, Bob was very shy and I am the exact opposite. So, I knocked on his door one Saturday afternoon and asked him to go out with me to Blue's Fest with some of my friends and I. ( our wedding vows actually tell the story) He accepted and we have been together every day since then. We were married in 1999, with all of our children being our best men and maids of honor. It was a small but charming wedding ceremony at a local restaurant in Carleton Place. The highlight of my day was having my father walk me down the aisle, which is something I had dreamed about since I was a little girl. My father, whom had a stroke and was left paralyzed on one side, could not walk a few months before the wedding, he was wheelchair bound. But, I am asked him to give me the honor of escorted me down the aisle and he practiced with a cane to walk for months. I couldn't control my emotion when on my wedding day, my father met me and walked me down the aisle...walked me… all of his practice had paid off. Our wedding was the happiest day of my life, with my father and all our children and family. Unfortunately, when we were on our little honeymoon, my father was admitted back into the hospital and died a week later. But, I am grateful that I got my dream come true, and my father was there for me on one of the most important days of my life. Our love story has had its ups and downs raising four children, from two different families, trying to create one big family. It has its struggles, but we all loved each other and vowed to each other till death do us part. Unfortunately, death happened. One of our Jenna's passed away in September 2009, from a rare form of cancer. We spent two years in the hospital while she fought this disease with everything that she had, but the cancer won and we lost our sweet Jenna at seventeen years old. Our lives have been forever changed, and I am not sure that life will ever be the same. The other Jenna misses her sister desperately and has also struggled to deal with a drug addiction that took over her life, due to losing her beloved sister. Needless to say that our lives have been a series of tragedy and heart ache and through it all we have supported, loved and cherished each other. The year that we putting our sweet daughter to rest would have been our 10th wedding anniversary, we had always planned that on our 10th anniversary we would renew our vows to each other and have a dream wedding with all of our children. We did not have our dream wedding, we were so full of grief and loss and still struggling to help our oldest daughter deal with her addiction. That we just couldn't do it. I am happy to say that our oldest daughter is ok now, getting better every day and as a family we are beginning to heal and be at peace with our sweet angel in heaven. So, you see after all of our family's tragedy and grief. We made it as a family. I am so proud of each of them and especially my husband. He lost one of the loves of his life, his little girl. I would love to show him how proud I am of him as a father and a husband. Help us to renew our vows to each other, and show the world that you can overcome anything if you have the love and support of a great spouse and family. We just spoke to Jennifer and she is SO excited to recommit herself to the love of her life Bob and have their kids stand up for them. She kept the contest a secret from Bob and his reaction was one of joyful tears! We love him already! Cannot wait to remarry you InStyle in 6 sleeps!!! !